The CST/Berger 2000 ft. Self-Leveling Horizontal Rotating Laser Package is an essential apparatus for exterior leveling projects such as excavating footings, foundations, site work and grading. The laser offers 3/32 in. accuracy at 100 ft. and has an extended range of 2000 ft. diameter to handle larger job site applications. Key impact areas of the device are protected by an overmold thats constructed to handle perilous job site conditions and designed to withstand a drop from 3 ft. The rotary head is enclosed with high-precision glass and a durable gasket material to deliver an approved IP56 rating to guarantee protection from construction dust and an occasional rainstorm. An anti-drift feature automatically powers down the laser if the unit is bumped or has slowly drifted from the original benchmark to ensure greater accuracy on a job site. Single-access slope control in manual-grade mode allows you to use the up and down arrows to change the slope of the beam to match the slope or pitch of the construction site. 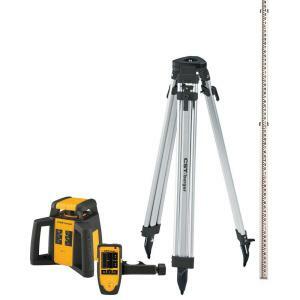 Durably constructed to withstand a drop from 3 ft.
Tbook.com crawls the web to find the best prices and availability on Levels and related Tools and Hardware products like CST/Berger 2000 ft. Self-Leveling Horizontal Rotating Laser Level Kit (5-Piece). For this page, related items include products we find that match the following keywords: "Level" at our vendor partner Home Depot. CST/Berger 2000 ft. Self-Leveling Horizontal Rotating Laser Level Kit (5-Piece) is one of 154 Levels and related products listed in the Tools and Hardware section of Tbook.com If you have any questions on this product, please give us a call at 734-971-1210 during the hours of 9am - 5pm EST for assistance. Thank you for shopping at Tbook.com, the Internet Department Store!